You cannot listen to the pronunciation of hu because your browser does not support the audio element. sudden"Why are some translations grayed out?" Chinese character and stroke order animation"How do I write 忽 ( hū ) correctly?" 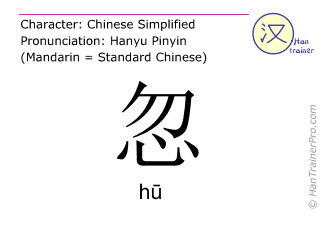 The traditional Chinese characters of hū are identical with the modern (simplified) characters displayed above. 忽 is composed of 8 strokes and therefore is of low complexity compared to the other simplified Chinese characters (average: 13.1 strokes). All words in this dictionary (more to come) were taken from the multimedia Chinese learning software Han Trainer Pro. This Chinese-English dictionary is currently under development.